Sometimes the toxicity of reptiles and amphibians was so powerful that their breath became a deadly weapon. The rarely-seen toads and salamanders in particular were blamed for all sorts of evil deeds. The Lebraude is a sort of large lizard or salamander with black and yellow skin. It breathes once per day, and anything that contacts its noxious exhalation dies instantly. Humans perish, livestock expires, and even trees and grass wither up. In Puy de Dôme the Souffle (“Breath”) is a small snake or salamander whose breath kills anyone it sees first. Toads in Provence kill birds with their breath. In Vaucluse a salamander’s breath will cause humans to swell up until they die in their skin. The Souffle, Soufflet (“Bellows”), or Enfleboeuf (“Ox-sweller”) of Auvergne inflates and kills cattle. Sometimes it is not the exhalation, but the inhalation that is feared. In the Cher, it was said that toads sucked bees out of hives, opening their mouths wide for the insects to come in. Reptiles born from a rooster’s egg in the Hautes-Pyrénées can inhale and swallow anything nearby, including birds and children. Chicheface is as starved as its counterpart Bigorne is satisfied. This etiolated creature was said to feed solely on wives who obeyed their husbands, and as such was skeletal and malnourished. Of French origin, it featured in a number of facetious works from the 15th century and on. Both Bigorne and Chicheface are notably represented in frescoes at the Chateau de Villeneuve, in Auvergne, by Rigault d’Aurelle. Some confusion has resulted over the name. Chiche face means “thin face”, possibly derived from the Spanish chico, “small” (although Chapoulaud suggests a separate derivation from the patois chichou, “puppy”). Corruption of this word through intermediaries like chichefache has led to the alternate spelling of chichevache, “thin cow”, popularized in English. There is very little of the bovine in Chicheface. It is somewhat like a terrifyingly thin werewolf, barely skin and bones. Its head and body are those of a wolf, its forelegs are clawed and its hindlegs are hooved. Satire featuring Chicheface revolves around the lack of good and submissive women, and usually begs wives to remain independent and willful. Le dit de Chicheface (“The say of Chicheface”), preserved in the Auvergne mural, depicts Chicheface with its prey in its mouth. Chicheface laments its lot in life – Moy que lon appelle Chiche Face / Très maigre de coleur et de face (“I who am called Chiche Face / Very thin of color and face”). The woman held in its jaws is the only thing it’s found to eat in ten thousand years. Des ans il y a plus de deux cens / Que ceste tiens entre mes dens / Et sy ne lose avaler / De peur de trop longtemps jeuner (“For more than two hundred years / I’ve been holding her between my teeth / And I dare not swallow her / For fear of fasting too long”). As for the long-suffering woman, she regrets her decisions in life, having done everything her husband told her to do, and begs wives not to do the same – Vous qui vivez au demourant / Ne veulez pas come moi faire (“You who live at home / Do not do as I did”). Jubinal’s satirical poem on the life of Saint Genevieve mentions Chicheface in a warning addressed to the saint: Gardez-vous de la Chicheface / El vous mordra, s’el vous rencontre (“Beware of the Chicheface / It will bite you, if it meets you”). In the Life of Saint Christoffle, we are given the curse Va, que tu soys confondu / Orde, sanglante chiche face! (“Go, may you be confounded / Vile, bloody chiche face!”). Chaucer mentions “Chichevache” but not its plump companion. In the Clerk’s Tale, “noble wives full of high prudence” are warned not to imitate the good and patient Griselda “lest Chichevache you swallow in her entrail”. 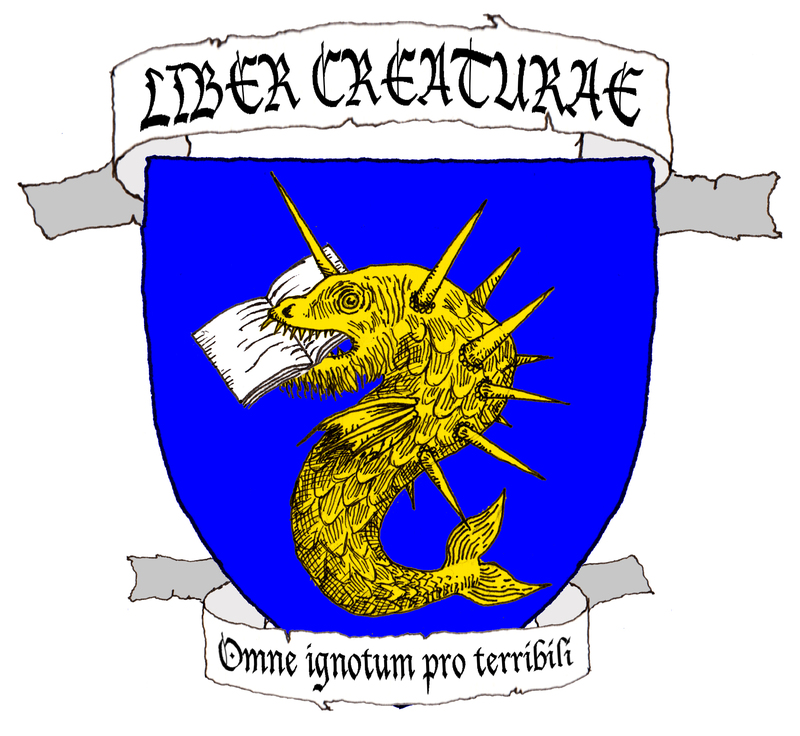 In Lydgate’s Of Bycorne and Chichevache it is “Bycorne” who eats submissive wives, inverting the roles. The skinnier Chicheface has proven more enduring than its rotund companion. Various carved grotesques have been described as the Chiche without further elaboration. In all likelihood Chicheface’s existence may have preceded the misogynistic legend attached to it, and it continued to exist in the popular mind as a sort of hideous bogey. Allou, C. N. (1821) Description des Monumens des Differens Ages. F. Chapoulaud, Limoges. Jubinal, A. (1837) Mystères Inédits du Quinzième Siècle, t. II. Téchener, Paris. During his time in Spain, Prosper Mérimée was introduced to a number of current superstitions by his traveling companion Vicente. This worthy Valencian informed him of certain animalitos, “little animals”, available for purchase in France from unscrupulous sorcerers. Nobody knows what they look like save that they are tiny animals that live in reeds. The notorious embellisher Dubois gives them dog mouths and lizard heads. The reed an animalito lives in is sold with a knot in one end and a sturdy cork in the other. Animalitos are magical beings, capable of granting their owners any wish, any request they desire. Napoleon had one of these imps with him, which prevented him from being killed while in Spain. Only silver bullets can harm those protected by an animalito. The animalitos are eating him alive. Mérimée, P. Les Sorcières Espagnoles. In Mérimée, P. (1873) Dernières Nouvelles de Prosper Mérimée. Michel Lévy Frères, Paris. The laughter comes from the Lupeux, a mysterious, perverse creature with a cruel sense of humor. The lupeux is heard but not seen. Its appearance is uncertain and varies from area to area, but it usually has the head of a wolf, as hinted by its name. “Ah, ah!” You don’t heed your friend’s warning and call out once more. “What’s funny?” That’s when the floodgates open. The lupeux’s laughter ceases, and it begins to talk to you. In its friendly, genial, engaging voice, it relates juicy rumors, scandalous gossip, inside secrets. If you’re single, it tantalizes you with its matchmaking, sets you up with the hottest dates; if you’re romantically involved, it taunts you with your partner’s infidelity and reveals all their secret lovers. There is seemingly nothing the lupeux doesn’t know – or pretend to know. Once in the lupeux’s spell, you do not tire of listening to it. You follow its congenial voice as it travels through the skeletal branches of blasted willows, desperate for more. Then the voice stops moving, and you stop in front of a pool, crystal clear, reflecting you and all your hopes and fears, all the tales the lupeux has planted in your head. You come closer for a better look – and the lupeux pushes you in. As you sink into the bottomless pool, as the cold water pours into your lungs and you take your last breath, you see the lupeux perched on a nearby branch, watching you drown and laughing in its charming, friendly voice. “Ah, ah! Now that’s funny”. Jaubert, H. (1864) Glossaire du Centre de la France. Imprimerie et Librairie Centrales de Napoleon Chaix et Cie, Paris. Sand, G. (1858) Légendes Rustiques. Amorel et Cie Libraires-Editeurs, Paris.